SwiftKey now offers real-time message translation on Android thanks to new integration with Microsoft Translator. This let users to translate their conversations without having to leave the app they’re in. 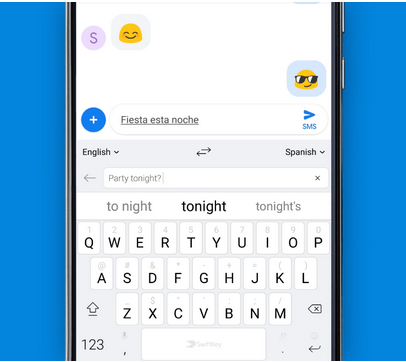 With an update out today, SwiftKey for Android will translate incoming and outgoing messages in real time and it will be able to do so for over 60 languages. If you wish to use the feature offline, then you’ll need to install Microsoft Translator. Android users can access the feature through SwiftKey’s Toolbar — just tap the plus sign in the upper left corner of the keyboard to get there. This is good. But i love Touchpal. I wish the can upgrade like Swiftkey. I used to love TouchPal but they flooded my phone with annoying ads and that made me resort to SwiftKey. SwiftKey is good, their themes are totally free too. Swiftkey has been my thing buh a lot of its features is lacking on the ios platform.. And no substitution, lemme wait and see if they will remember ios. My favorite keyboard, one of the first app I install whenever I get a new phone. Can’t use any phone without swiftkey. It’s simply the best. the update Is so nice. Is dre a solution to that?